Cut cabbage to small pieces. Heat oil in pan and add cabbage and choppes green chillies. Now add sesame seeds, cumin seeds, haldi, salt, udad dal and garlic. Cook till cabbage is soften. Cool and grind it to paste and add thinly chopped cilantro. Now make a tempering. Heat oil and add mustard seeds, cumin seeds, curry leaves, red chillies and udad dal. Add this tempering to chutney. 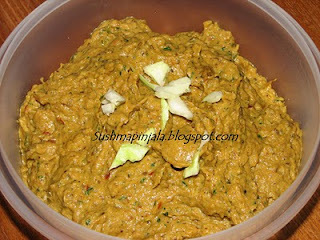 This chutney can be served with rice, dosa ,idly etc..